Last week I attended the EFI Connect user conference in Las Vegas and found it to be a bit different than in previous years. Yes, the attendance was large and similar to last year. Yes, the tone was again upbeat and positive. Yes, there were a vast number of educational sessions, equipment demonstrations, vendor presentations, and general camaraderie among attendees. But there were also key differences. The biggest differences to me were the lack of acquisition announcements and a virtual repeat of last year’s messages instead of a bold, new vision. To me, these are good things. In fact, I think they’re great. Think about it, it’s exciting and newsworthy to present new visions but you really don’t want a company to change directions every year. EFI, and the industry, has had struggles in 2017, but EFI clearly believes in their strategic direction and are continuing to follow it. Not announcing a course change seems like a very strong message to me. 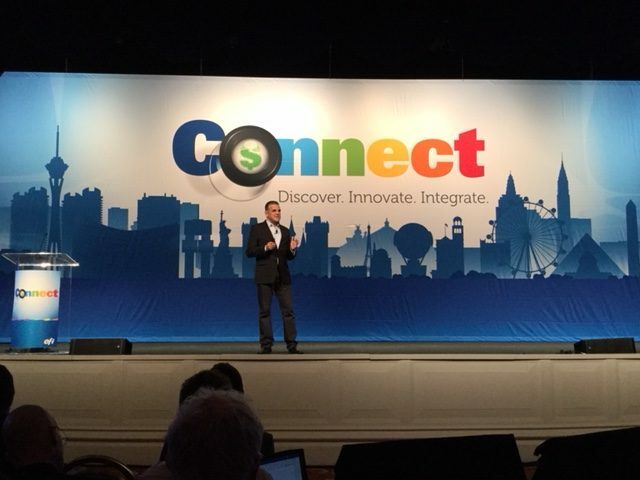 EFI CEO Guy Gecht addresses the crowd during the opening keynote on the first night of EFI Connect in Las Vegas. Company acquisitions, like new strategic directions, are also fun and newsworthy topics and EFI certainly has made a lot of them. This year, not so much though, and I also think that sends a strong message. It seems to me that EFI has been acquiring companies over the years to define and fill out their company’s footprint in the industry. They now seem to have largely completed that task covering large and grand format segments, commercial printing, in-plant, fabric, textile and packaging industries, and, of course, workflow, productivity and MIS solutions. Now, it seems, they are focusing on building on that footprint. I heard several attendees mention that EFI now seems to be focusing on their customers. While I’m sure that’s true, I don’t think that they have been ignoring their customers in the past. Rather, I think that what these attendees heard was that EFI is solely focusing on increasing the depth, robustness, understanding, and effectiveness of their solutions in the markets they serve. I see it in the tools they’re developing to explain the ROI of their offerings and to help their customers implement and roll out their solutions and I think they’re heading in the right direction. 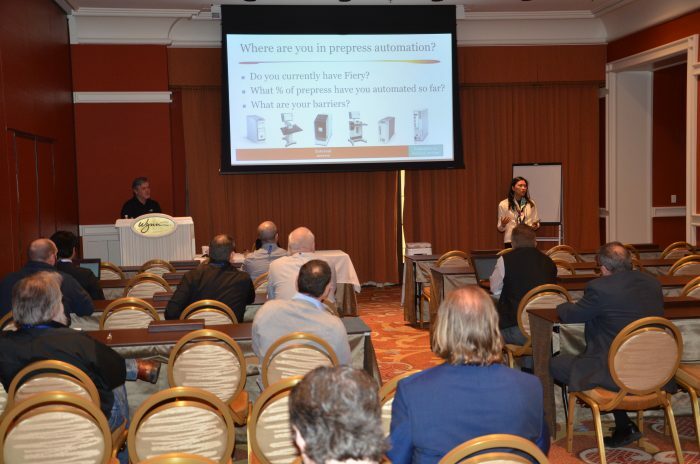 One of the in-plant sessions at EFI Connect 2018. One other difference at Connect this year was that EFI added a true, in-plant educational track. The session topics were on target but the sessions weren’t as well-attended as I had hoped. This isn’t too surprising since EFI didn’t really begin working on developing and promoting this track in earnest until the fourth quarter. Again, I applaud them for reaching out to this important segment of their customers and I expect in-plant participation to increase next year. EFI offers a tremendous Fiery University online learning for their users, but anyone who has been to Connect will certainly confirm the benefits of personal interaction with EFI engineers and executives, networking with other users, and hands-on demonstrations which just cannot be replicated online. I highly recommend going to Connect 2019 if you have Fiery, or PACE, or Monarch, or Digital StoreFront, or any other EFI products or solutions. I look forward to what EFI can do in the coming year with their enhanced focus on their clearly defined market space.